After a workout or a long day I love to re-fuel with this Chocolate Smoothie Recipe which is delicious and nutritious! 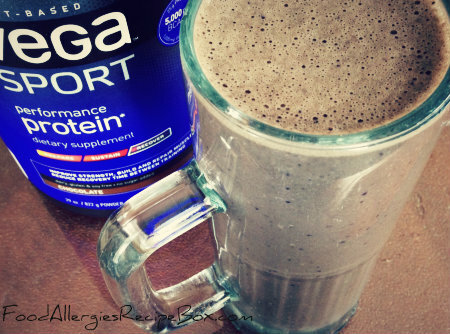 I choose to use Vega One as my protein powder, which I love, however you can use another brand or us rice protein powder. I like this brand as it is a plant based protein powder packed with a lot of nutrients, however always make sure to read the label to confirm it does not contain your allergen and if needed call the manufacture to check in with their manufacturing processes, click the below link to read more about their ingredients to see if it is a right fit for you! With the chocolate protein powder and a little sunbutter (or nut alternative butter of your choice - see below for a few options) and some blueberries this is a very tasty and satisfying treat, perfect for any time of the day. I will sometimes make this smoothie the night before so that it is ready for me when I wake up before leaving to instruct my classes. For this easy and quick recipe all you need to do is place all of the above ingredients into a blender and pulse until smooth and creamy. Enjoy this delicious recipe right away or place into a cup to save for the next morning. If saving for later make sure to shake well before drinking. I love sunbutter however if you have a seed allergy this might not be the right choice for you. Depending on your allergens there are alternatives such as wow butter which uses soy , no nut butter or the sneaky chef which both use peas, I haven't tried no nut butter or the sneaky chef yet however I will be looking out for those one in stores! Remember to always read labels even if you've purchased that product before and when in doubt follow up with the manufacture! What's your nut free peanut butter alternative of choice and why? Let us know on Facebook. Return from chocolate smoothie to food allergies home page!